There are many great flags that are not in great shape. With some work and expertise, these great flags can be restored and will still present beautifully. Collectors can find real gems that just need some care and attention to be restored to a more presentable state. And in many cases, flags may not even require restoration, as their aged and worn appearance actually contributes to the overall attractiveness of the flag. The fact is, most flags were made to be flown or waved, and often for prolonged periods and in all weather conditions. Flags flown outdoors are subject to fading from sunlight, damage from strong winds, holes from mothing and other insects, dry rot and water staining from rain, and many other maladies that occur through the natural use of a flag. can be restored to its full glory. antique furniture can relegate pieces to comparatively bargain basement prices. 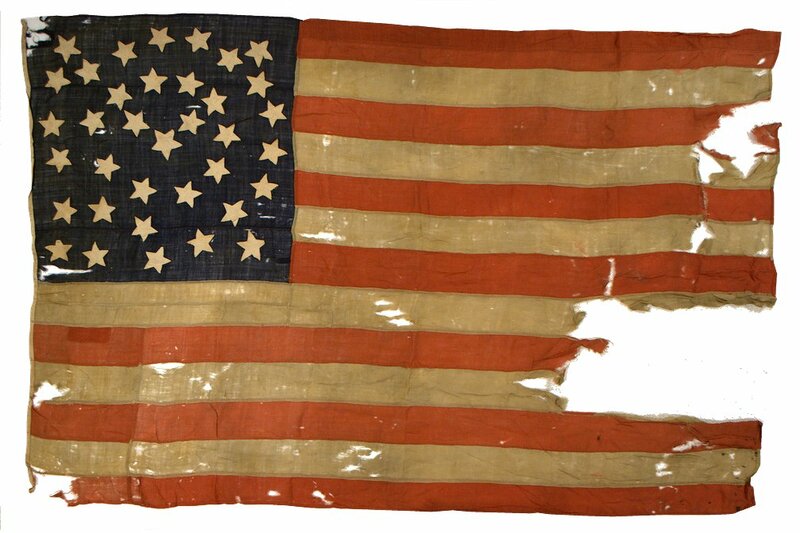 Yet with antique flags, condition is one of the least important contributors when determining the value of a flag. One of the primary reasons that condition contributes so little to value is that flags can be carefully restored and often present beautifully either in their original state or their restored state. Backing. 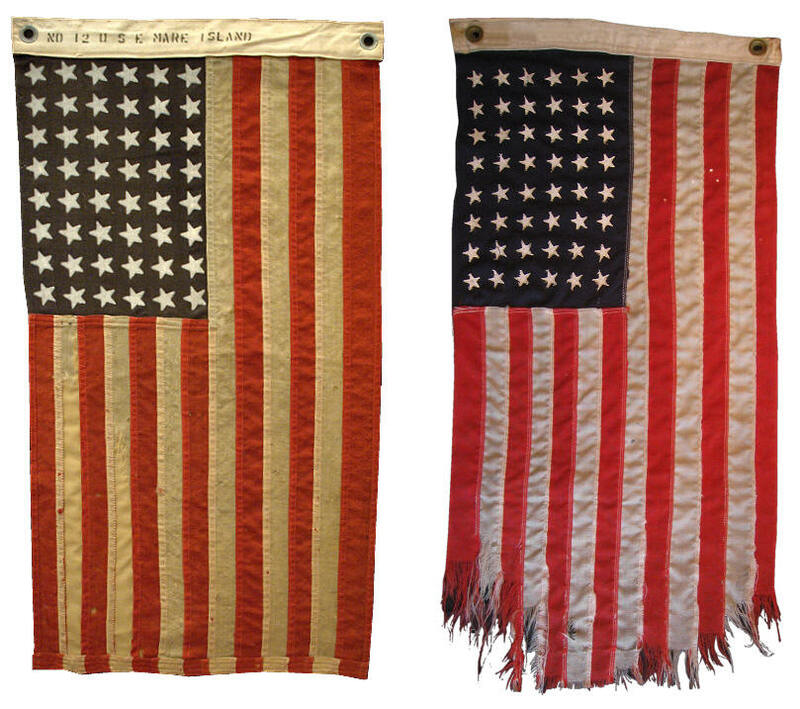 One of the most common ways of restoring a flag is to back the flag with fabric of similar coloration. In some cases, an entire mock flag might be made in the exact dimensions of the original flag. In other cases, smaller sections of fabric might be prepared. Depending on the flag's materials, the flag can be carefully hand sewn to the backing, such that the backing masks the losses in the flag. In a press mount, the backing material can be stitched to the mount, with the flag resting on top. Above are two World War II U.S. Navy No. 12 Ensigns. These small ensigns were used during the war on small craft, including PT boats. The flag to the left, made of wool with stars of rubberized paint, was made at Mare Island Navy Yard near San Francisco, California. The flag to the right, made of wool with sewn stars, was used aboard PT 560, Squadron 29 and saw service in the Mediterranean Sea and the English Channel. Both flags show wear that would have occurred as a result of high speed winds on fast moving boats. Note that on the flag to the left, the top two white stripes (left in photo) are backed with similar color fabric to mask areas of loss. The PT Boat to which it originally belonged has been lost to history. World War II Battle Flags such as these are rare and highly sought after by collectors. Backed fabric of matching color is mounted behind areas of loss on this World War II Era Ensign. Repairing. Reversible repairs can also be made to flags to restore them. Repairs could include carefully stitching closed splits in the fabric, darning holes in the wool, or applying patches to areas of loss. For the purposes of collectors wanting to restore their flag's appearances, backing the flag instead of darning or applying patches is a more reasonable option. In some cases, conservators might even remove modern patches from flags prior to backing them if the modern patches are poorly done or detract from the flag's appearance. Carefully stitching split seams closed, with carefully matched thread, can greatly improve a flag's condition and appearance. This can also be done as the flag is mounted during conservation. Any repairs made to the flag should always be done such that they are completely reversible. (If the hand stitching of a closed split or a patch is removed, the flag is once again in its original state). Never glue or permanently affix fabrics to the flag. Restoring. In some cases, defects in the flag, such as bleached spots or significant stains that detract from the flag's appearance could be addressed by careful restoration using reversible pigments or paints. For example, if the canton of a printed parade flag has a small bleach stain, but the rest of the canton is vibrant and intact, a conservator might apply a small amount of carefully matched conservation quality paint to blend the spot with the rest of the canton. In some cases on printed flags, stars might also be carefully restored in this way. This approach requires the correct materials and I recommend it only be attempted by an experienced professional. 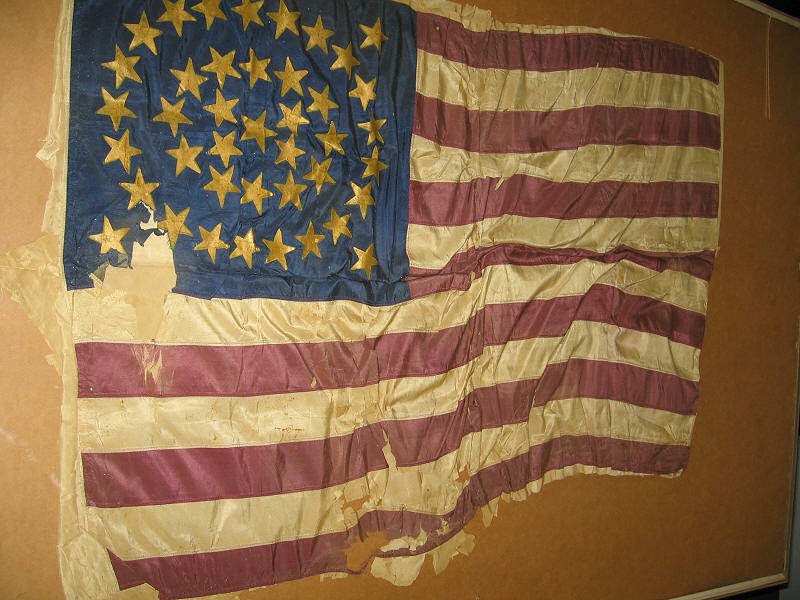 Any restoration done this way should be completely reversible, meaning that the paint that masks the defects can be lifted or carefully washed out without further damaging the flag. 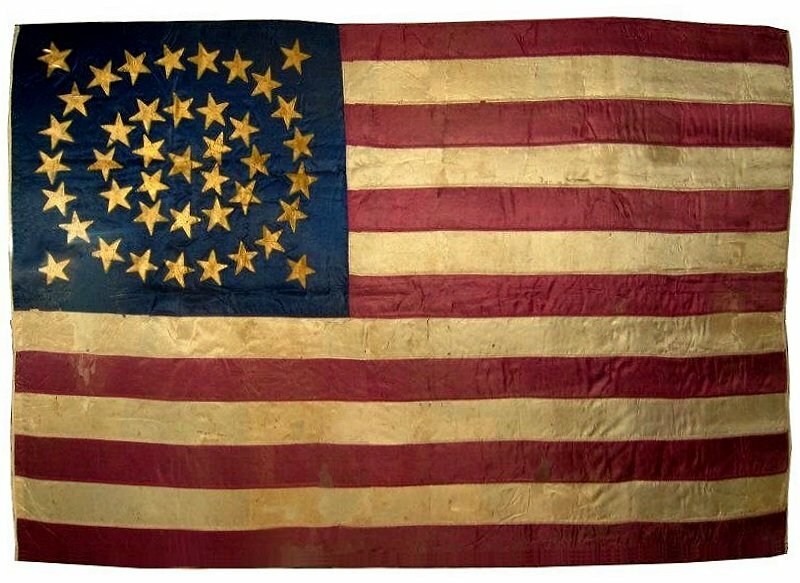 This beautiful 42 star military grade flag began life with just 38 stars, to which four central stars flanking the center star were added. Made of weighted silk, the flag has become brittle with many splits and some losses. Yet the flag is remarkably intact, with more than 90% of the flag present. At some point, when it was originally framed decades ago, additional silk had been sewn along the edges of the flag and folded behind it to provide pressure under the flag when it was in the mount. Once the additional silk was carefully removed, it was reused, along with new silks and silk blends of blues and maroon, which were placed behind areas of loss. Antique cream colored silk backs losses in the white stripes. In some cases, various silks (silk crepe, silk organza, and other weaves of silk) are combined, one on top of the other, to provide the correct luminance and coloration to the backing. The backing silks are not affixed to the flag in any way. Instead they are carefully placed behind the flag in a pressure mount. In a pressure mount, the flag is sandwiched between UV Acrylic Glass and a pillow of batting covered with dye-set cotton velvet. Thus the restoration is completely reversible. Above left: The flag as it originally arrived. Above right: The flag after conservation mounting with areas of splitting and losses backed. 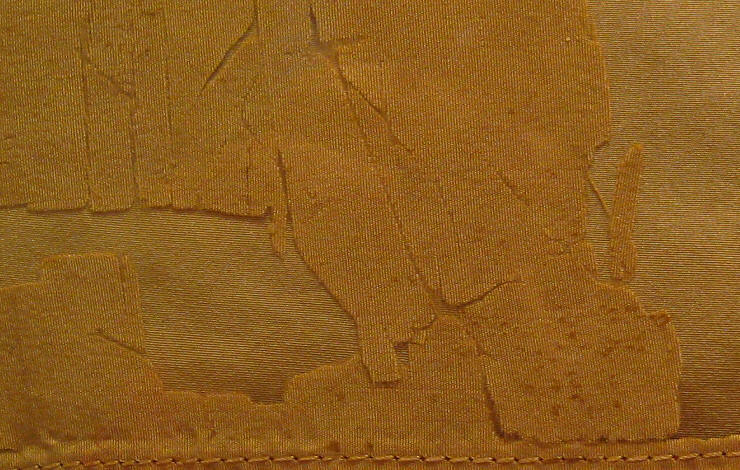 Below: A close up of an area of loss backed with antique silk.